Luise asked me to write something short and quick today. And to stick to the subject (which I assume is ice cream). That was 12 hours ago. To be fair, I’ve also been carrying a baby (with a new name) and a feverish Isac for a huge chunk of those hours. Excuses aside, I’m not good at quick. I’m not slow. But I’m definitely not quick. I like to let things take time. Explore all possibilities. Thorough. I’m thorough. Not slow. Well maybe a little bit slow. In a good way. Except when facing meaningless everyday decisions (like picking clothes for the kids), then I’m slow in a bad way. I’m apparently not good at sticking to subjects either. Ice cream, here we go. 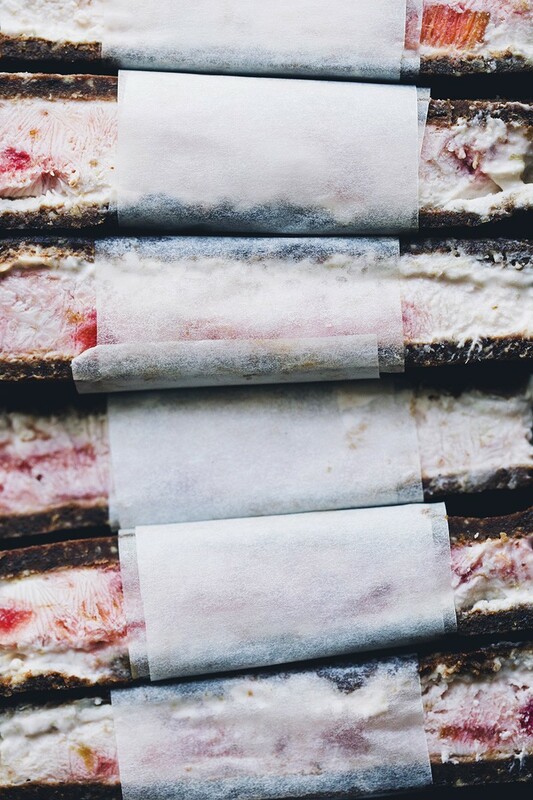 Making homemade ice cream sandwiches is a fun little weekend project. It doesn’t take too much active time but they do need a couple of hours to firm up in the freezer. 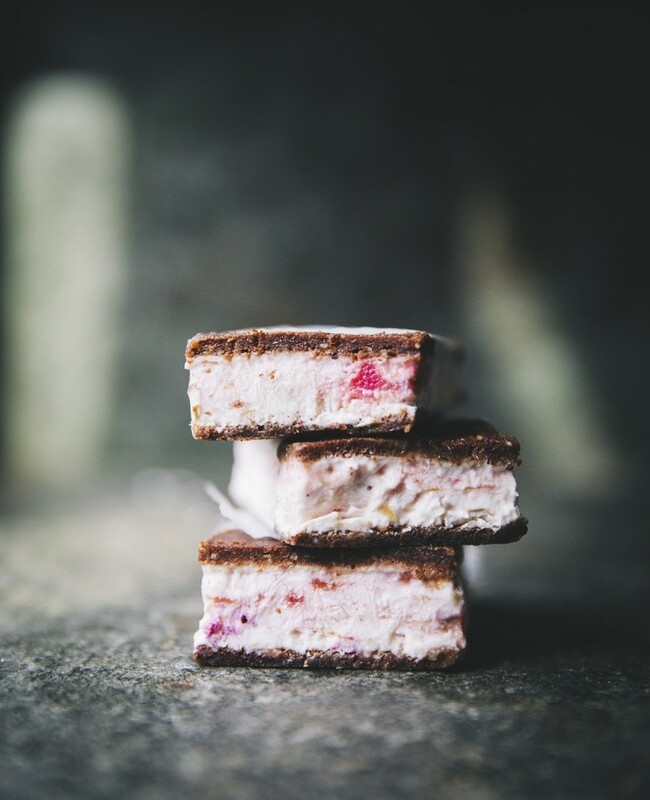 Unlike normal sandwich bars, ours are made with raw wafers and a rhubarb swirled no-churn ice cream. 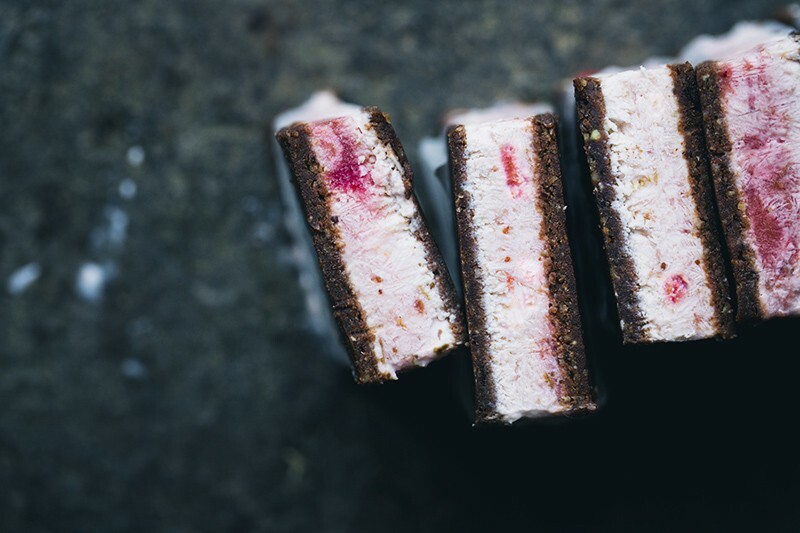 The raw wafer is simple to make and the rich chocolate hazelnut flavor balances the tanginess from the rhubarb nicely. We are showing how to get the wafer thin and perfectly sized in the video further down. We have tried two different versions of the ice cream and are sharing both here. One is made with mascarpone and quark cheese (so it’s technically a frozen cheesecake) and is super simple and delicious. 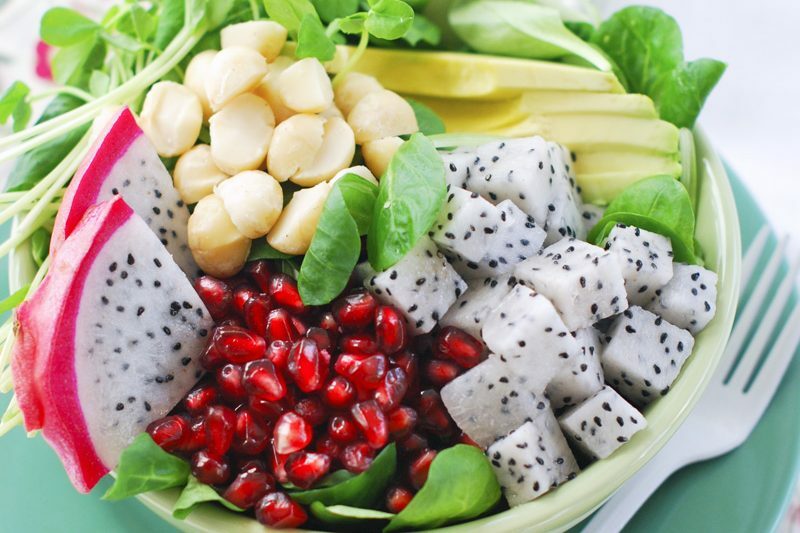 The other version is vegan and made with coconut milk and soaked cashew nuts. You can use an ice cream maker to get it even creamier but we simply skipped that extra step this time. Unless you’re an ice cream purist, you’ll see that the no-churning method works well for a sandwich bar, just let them soften a few minutes before digging in. They are super tasty and a real treat to have ready in the freezer. We’ve cut them pretty big here but you could cut them in squares instead and end up with twice as many. We created this little youtube video for a more visual demonstration on how we make these. It takes a little extra time to make these videos but it’s lots of fun and we feel that they really help understanding the cooking process. Please leave a comment letting us know if you like us to continue making more videos. 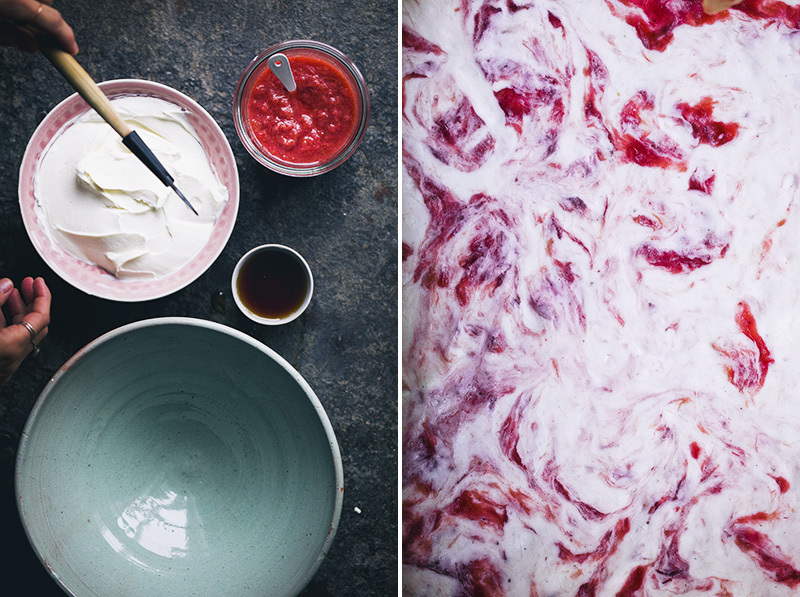 Note: We use the Rhubarb & Strawberry Jam on everything from sandwiches to breakfast yogurt and porridge. So make a double batch while you are at it. The sweetness depends on the quality of the fruit so taste and adjust accordingly. Start by making the jam. Slice rhubarb and strawberries thinly and add them to a sauce pan together with the rest of the jam ingredients. Cook on low heat for approx. 20 minutes until soft. Use a hand blender to mix it if you prefer it smooth, or leave it chunky. Let cool entirely. Meanwhile, prepare the raw hazelnut wafer. Add hazelnuts, rolled oats, cacao powder and salt to a food processor and mix thoroughly until the texture resembles sand. Pour into a separate bowl. Add dates and coconut oil to the food processor and mix into a paste. Pour the mixed nuts back and pulse everything until it’s combined into a dough. Roll it into a log and divide into two equal halves. Use a pen to copy the exact size of the baking dish onto a baking paper, then roll out one of the wafer dough halves on the baking sheet until it has the right shape, use a second baking sheet on top to prevent the rolling pin from sticking. Transfer the baking paper with the wafer to the baking dish and place in the freezer while preparing the ice cream (or vegan version further down). Combine quark cheese, mascarpone and 2-3 tbsp maple syrup (depending on how sweet you prefer it) in a mixing bowl. Add 1/2 cup / 125 ml of the cooled rhubarb & strawberry jam. Stir until combined. Take out the baking dish from the freezer and pour the ice cream mixture on top. Spoon more jam on top (roughly 1/2 cup / 100-150 ml) and use a spoon to swirl it evenly. Put back in the freezer for 1-2 hours to firm up. Roll out the second half of the wafer dough using the same method as the first. Use a fork to make hole patterns and then turn it upside-down on to a second baking sheet. Remove the ice cream from the freezer and carefully transfer the wafer on top of the ice cream. Put it back in the freezer for 3-4 hours until completely firm. 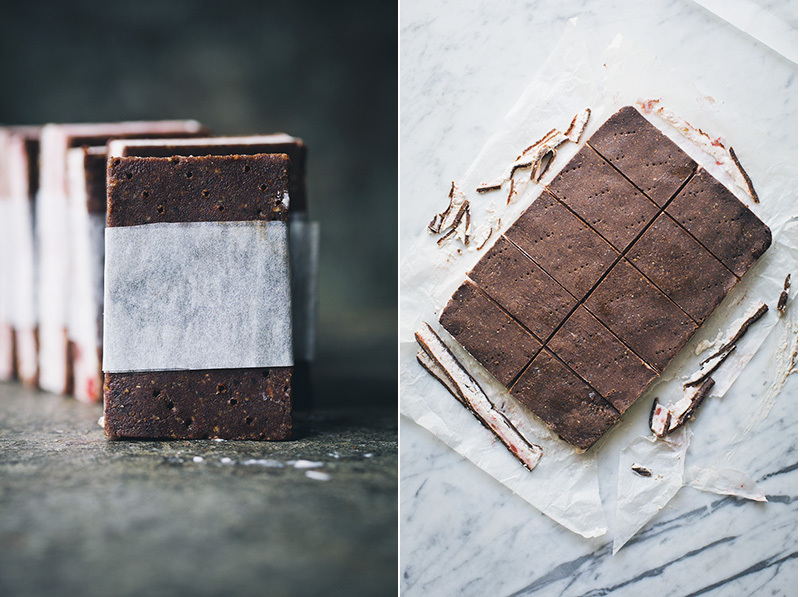 Then take it out, cut into 10 rectangles or 20 squares using a sharp knife dipped in hot water, wrap with baking paper and store in the freezer. Drain the soaked cashew nuts and add them to a high-speed blender together with coconut milk, maple syrup and lemon juice. Mix on high speed until smooth. 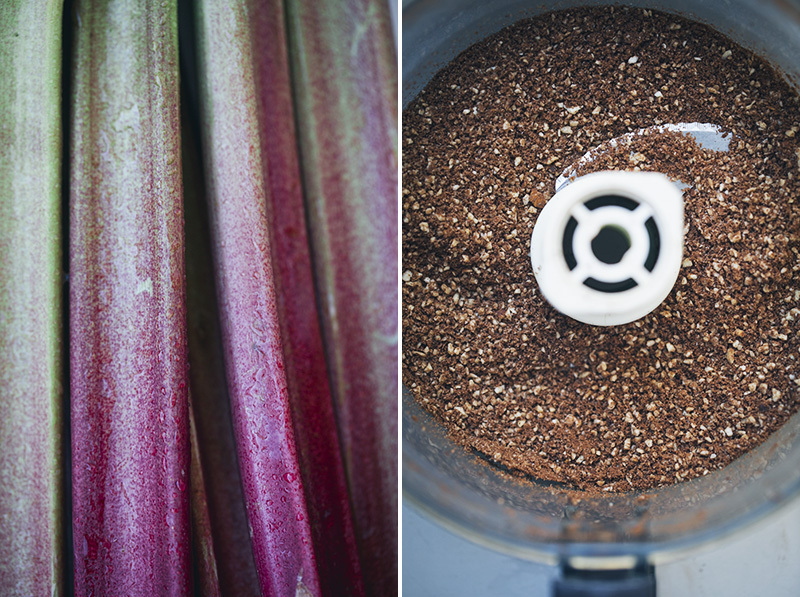 Add 1/2 cup / 100-150 ml of the cooled rhubarb & strawberry jam and pulse until combined. Take out the baking dish from the freezer and pour the ice cream mixture on top. Spoon more jam on top (roughly 1/2 cup / 100-150 ml) and use a spoon to swirl it evenly. Put back in the freezer for 1-2 hours to firm up. Follow the remaining instructions in the main recipe. Here’s another rhubarb treat I did the other day. 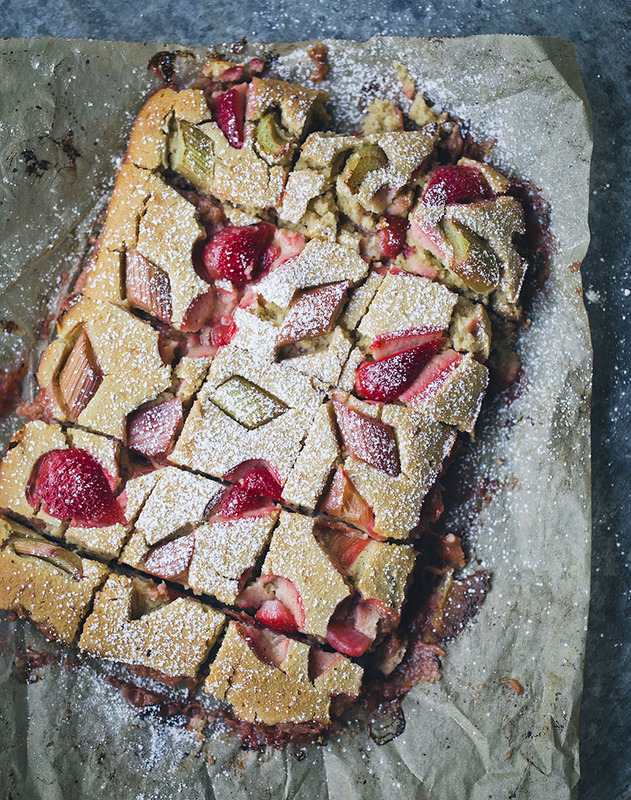 I didn’t follow an exact recipe but I kind of based it on this recipe from our archive and replaced the grated apple with lots of rhubarb jam and the apple slices on top with rhubarb and strawberry bits. 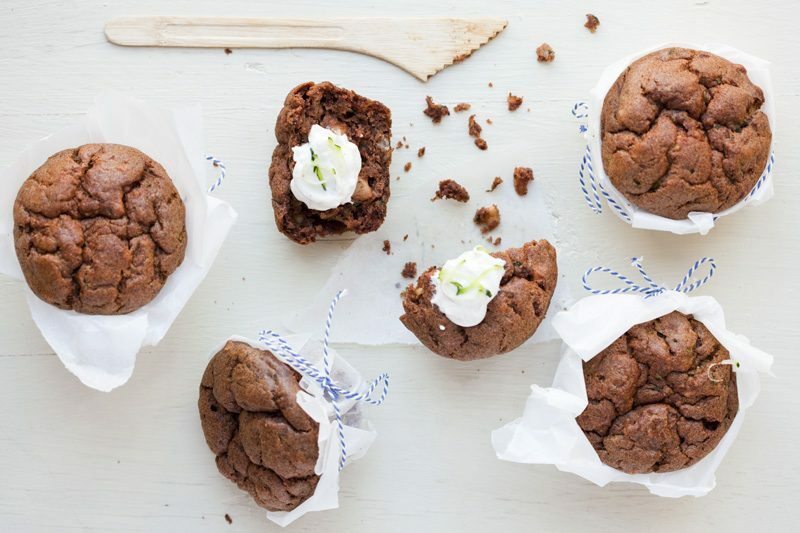 Skip the cinnamon on top and just add a little cardamom to the batter, in case you feel like trying it. This is an incredible ice cream recipe! Wow! and the video...just stunning! No doubt that your work is one of a kind. Hello from sunny Tel Aviv! Its sad to see you describing looking after your children's clothing needs as "meaningless." This de-values the work parents - ok mostly mothers - do in choosing, purchasing and selecting their kids clothes in order to suit weather, Occassion etc. It's another of the many tasks performed each day that are not valued by our society. 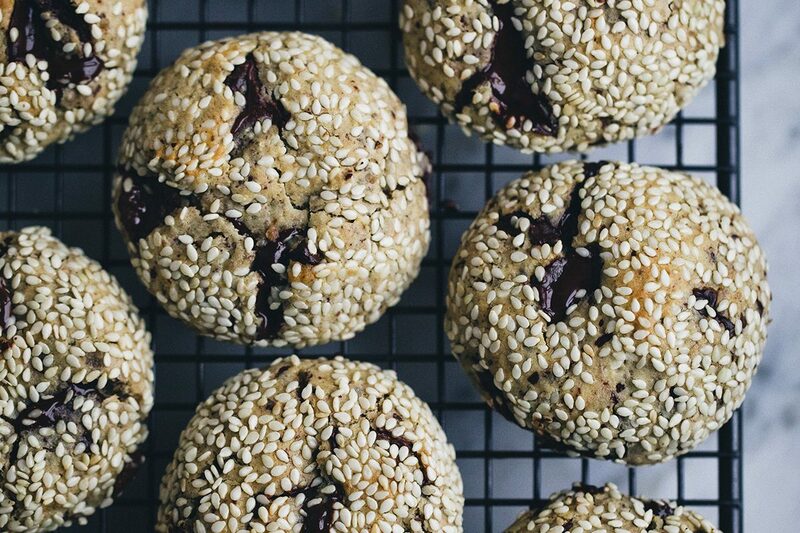 Great video and the recipe seems to be a winner! I love your recipes and I adore your videos ! Can't wait to try these-rhubarb/strawberry is one of my fav combos ! 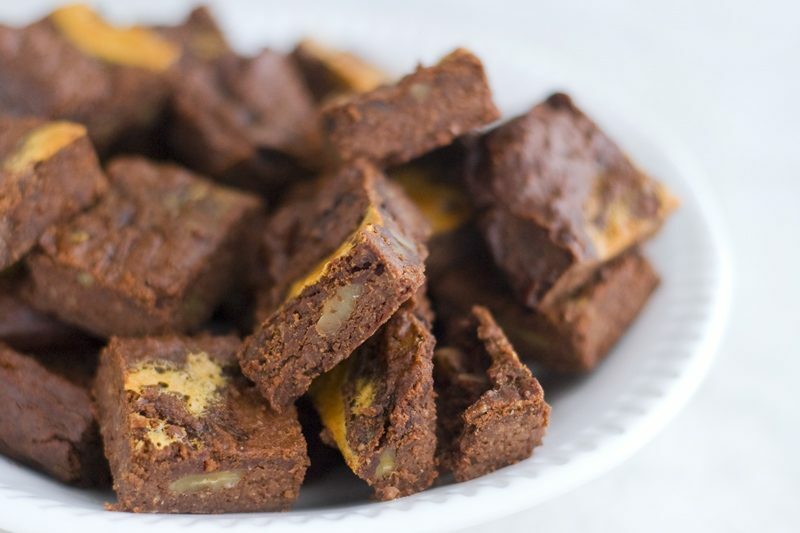 This looks delicious - I must make them soon :) The video is very helpful and make it easer to make. Thank you for that. I love the videos, please keep making them! Oh please make more videos, they are all fantastic! Please, please, never stop making videos! they are so awesome!!!! Looks delicious! I love your videos, they are BEAUTIFUL, fun to watch, and help me to understand the big picture with cooking the recipe so I don't get overwhelmed by all the instructions. Yes please keep making videos. I'm not lying when I say your videos are the only ones I ever watch. I love how different they all are, and the way they're shot always catches my attention. Which is difficult! :-) Plus I make several of your recipes a week and pour through your blog like a magazine so the videos give me something extra! I love rhubarb and this looks so good! Would love to make these soon. Your videos are the best! I just got some rhubarb and I guess it's time to try out your recipe. Looks just so good and perfect for the hot days we got lately. I love the videos!!!! They're all so beautiful and lovely. I can't wait to make these!